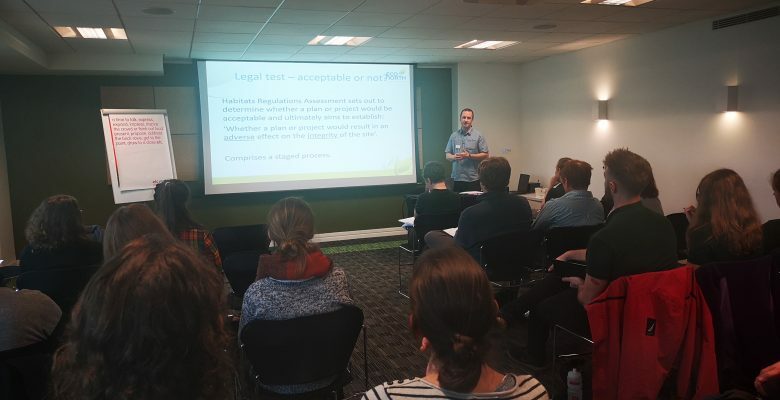 The first national conference to be held by the Wildlife Trust Consultancies took place on Thursday 28 February 2019 at Maple House in Birmingham. Approximately sixty people were in attendance including Managing Directors, Ecologists, Field Surveyors and Support Staff. The extent of the consultancies’ collaboration with the Wildlife Trusts and their support for the Trusts’ charitable works around the UK was recognised and celebrated throughout the event. The EcoNorth team joined our consultancy colleagues for the day, enjoying the opportunity to affirm old connections and to establish new ones. We were grateful to learn so much from the presenters who eloquently shared their knowledge and personal experiences with us on a diverse range of topics, from Ecological Clerk of Works to net gain. EcoNorth’s Principal Ecologist, John Thompson, played a key role in the proceedings. John’s forty-five minute presentation on Habitat Regulations Assessments showcased his extensive expertise on the subject and his effortless charm guaranteed that is very positively received. Congratulations to Mel Huggins, Business Co-ordinator for the Wildlife Trust Consultancies, who masterminded the organisation of this hugely successfully and inspiring event and, along with her team, ensured its smooth running throughout. For more information about this event or the Wildlife Trust Consultancies more generally, please click here.